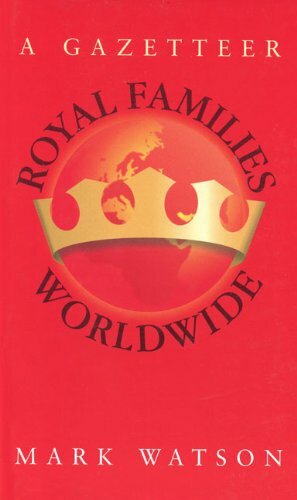 Amazon.com description: Product Description: This reference work attempts to bring together and arrange in standard form essential information on royal families around the world. The arrangement is alphabetical by country regardless of whether the royal family occupies the throne or not. Some countries have more than one family listed, either because there are rival claimants, or, as in the case of Uganda, for example, where several ancient monarchies are now contained within one modern state. The information for each country is given under the following headings: title of the head of the family; date and place of birth; age; parentage; siblings; religion; date of marriage; consort(s) with the previous name(s); children; place of residence; date ascended throne; constitutional status; source of income (whether public or private); and a brief history of the dynasty. Opposite each entry is a photograph of the head of the family, sometimes with his or her spouse.